In June and July of each year, at the entrance of the Orchard of Various Fruits in the Tropical Botanical Garden, the visitors could see a fantastic view: strings upon strings of oblate fruits are hanging in big trees; from the base of the branches to the tops of the trees, they are so numerous that they even bend the branches. Some are green, some are yellow and some are red, they look like balls carved with jades or beads made of agates. If you pick up some and have a taste, you would find they are so succulent, sour and sweet. 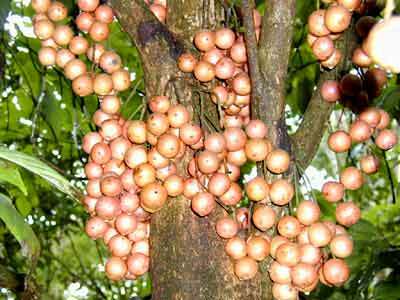 This is the famous wild tropical fruit - Baccaurea ramiflora Lour. It is an evergreen arbor and could grow as tall as 12 meters with a chest thickness of 60 cm. The fruit not only yields well, it is also a typical tree that could create fantastic views such as flowers in aged stalks and fruits on aged stalks. The flesh of the fruit is divided into three valoves; thus, it is often called "three-valove fruit"in Xishuangbanna. Baccaurea ramiflora Lour distributes in Canton, Hainan, and Yunnan in China, as well as Vietnam. It mainly grows in the forests in mountain valleys and hillsides.